If you own or manage a small medical business and want to start accepting credit cards, there are several options to choose from. However, you must first assess the needs of your company or medical practice so you can narrow down and effectively evaluate your options. When commencing your search for a credit card processing company, there are several factors you should consider. Is the company affiliated with a professional organization that you're a member of? If so, there's a strong possibility they are well acclimated with your line of business in the medical space and offer tailored solutions. Also, be sure to inquire about potential discounts that may be available to you. The merchant solutions provider should also offer a 24/7 customer service hotline with representatives who are knowledgeable about the needs of businesses in the healthcare industry. Otherwise, you could inconvenience your patrons if issues with the processing system remain unresolved for an extended period. If your patients will be using non-traditional forms of payment, such as Care Credit or the Citi Health Card, you definitely want to consider a merchant who will accommodate them. Equipment fees: You will need to consider the setup costs along with the actual costs associated with the equipment you'll need to process debit and credit card transactions. Transaction processing fees: These are also known as interchange fees and depend on the amount of the transaction, card type, and whether the card is present. Statement fees: If you opt-out of online statements, a small fee may be assessed to cover the cost of paper statements. Administrative fees: Some companies charge a flat fee for using the service and an additional fee if the aggregate total of transactions for the month fall below a certain threshold. You can also scour the web to get a feel for their track record and how they do business. Simply enter their name into Google's database or search FTC.gov to see what others are saying. "Look for solid experience and a proven track record," a report from Solveras titled "Credit and Debit Card Processing for Medical Practices" suggests. Are the transactions encrypted to protect your customers' personal information? The privacy of your customers or patients is of the utmost importance, so you want to ensure the merchant solution's provider offers enhanced security features and financial protection in case a data breach arises, the Solveras report adds. 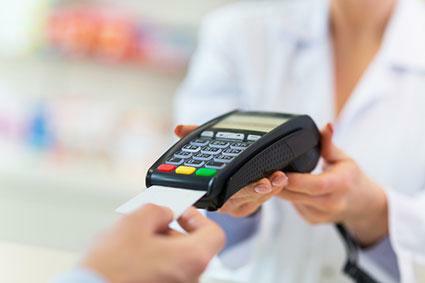 To learn more about the various credit card processing options for small medical businesses, refer to the comprehensive list from CardPaymentOptions.com. The American Medical Association also recommends TSYS Merchant Solutions for payment processing. While accepting credit cards is a great way to boost profit margins in your company, you should conduct a cost-benefit analysis for each provider before signing on the dotted line. Also, inquire about any early termination fees that may apply just in case you decide to go with another merchant processing solution later on down the line.